News Corp. CEO and founder, Rupert Murdoch, let the tweets fly this weekend humbly claiming he screwed up "in every way possible" with MySpace. Additionally, he accused Google of streaming illegally obtained movies and chastised President Obama for recently stating his opposition to SOPA, accusing the president of being in cahoots with Silicon Valley executives. The media mogul is well-known for being opinionated, vocal and also an ardent opponent of piracy. Murdoch's longstanding issues with Google have also been well publicized, such as criticizing Google News for being "thieves" and even threatening to block the aggregator from News Corp. sites entirely. Naturally, it should be no surprise that Murdoch took a little bit of time over the past couple weeks to rail on those who would pilfer copyrighted works, like Google. 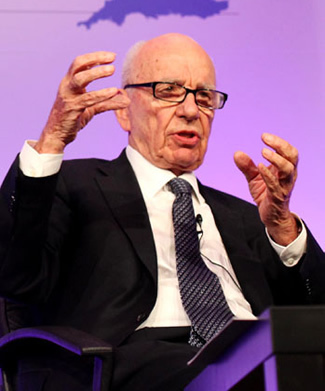 In 2005, Murdoch spearheaded a deal in which News Corp. acquired MySpace for $580 million. The iconic social network plummeted in popularity as Facebook opened its doors to the masses the following year, but not before Murdoch struck a $900 million advertising deal with Google. Thanks to their advertising partnership with Google, News Corp. did manage to make their money back on MySpace. Despite this, the once popular social networking site has been in disarray ever since its purchase. Murdoch sold the company in 2011 to Specific Media and Justin Timberlake for $58 million, just 10 percent of its original value. The new owners hope to revitalize MySpace as an artist-focused destination.